Last weekend .. was magical! 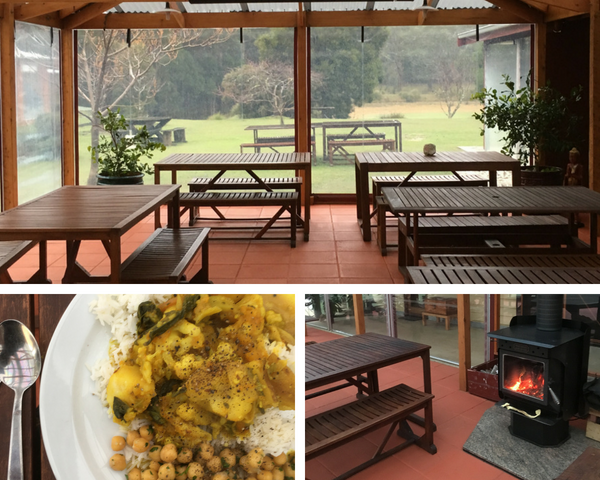 Along with my beautiful friend and amazing yoga teacher Jenny Ellinghaus (and author of Yoga for Travellers) last weekend we presented our first overnight Bliss Bomb Retreat at the tranquil Rocklyn Yoga Ashram near Daylesford, VIC. Sanskrit from the word Ashrama ‘hermitage’ .. ashrams are places where people go on spiritual retreats. 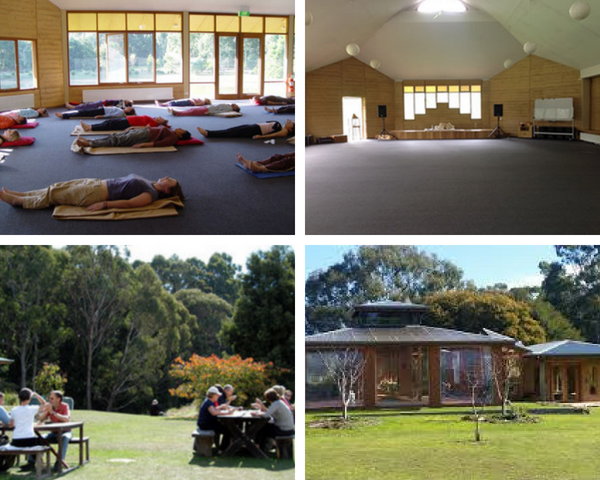 Ashrams provide a refuge for a devoted community, and an opportunity for lay practitioners to experience an immersive experience in a range of spiritual practices, including yoga, meditation, and chanting, along with time for stillness and self-reflection. Ashrams have existed in many different forms for thousands of years, mostly in India and following Hindu philosophy, and many still provide a spiritual direction in the traditional sense with a guru. As well as being able to step away from the ‘day-to-day-real-world’ for some fresh air, personal practice and time for reflection and stillness .. the community that lives within an ashram are also consciously contributing to a better world through devotion to selfless service and the development of qualities such as love, kindness, patience, and respect for others. Why go to an ashram? After spending one day at the Ashram a few months ago, Jennifer and I realized that the Rocklyn Ashram would provide our students with an amazing opportunity .. not just to step away from their daily life while staying close to home (no flight to India required) but to truly experience some of the beautiful and sacred ashram practices in a dedicated environment. Anyone can attend an ashram, but it is nice to visit with a friend, and we felt that we could be that warm friendly face to help navigate the practices and offerings. More than just a taste of simple, uncomplicated stress-free living – this was a chance to immerse ourselves in yoga, meditation, pranyama, yoga nidra, chanting and fire ceremony – getting bumped out of our schedule and detoxed from technology! Ashrams keep you busy. Away from your normal routine, technology, and responsibilities, there is a vacuum that quite naturally leads us to personal reflection and contemplation; but there are also plenty of physical practices and daily life routines to keep us grounded and focused during our stay. Yes, each day usually starts before sunrise at 5.30am with yoga .. this is a potent and harmonious time for our practice .. and to balance this, with little digital or technological entertainment in the evenings and the deep darkness of the forest in Winter, everyone is ready to embrace stillness and sleep by 9 pm. Some ashrams are quite strict in regards to the rhythm of daily life, others are more flexible with creative and free time. 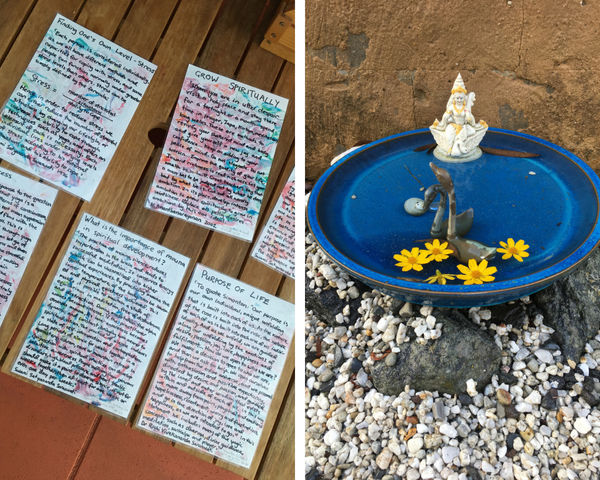 For our Bliss Bomb Retreat we embraced much of the ashram practices until Sunday morning when we shifted to some of our own offerings. Karma yoga is the path of service, which means participating in work practices designed to encourage selfless giving through small chores like sweeping the path or folding the yoga blankets for class. During karma yoga, we maintain full present moment awareness while completing our allocated action to serve the ashram .. in this way we detach from the need to be praised or rewarded, stepping aside from the ego’s yums and yuks. I swept the dining room floor with the fire roaring in the background, the rain falling softly outside, and remember just wanting to do a really nice job for everyone to enjoy returning for lunch later in the day. 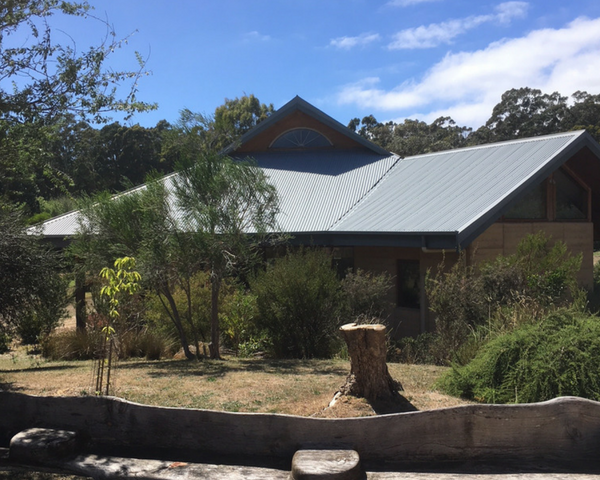 Nestled within the green tranquillity of the Wombat State Forest near Daylesford, the Rocklyn Ashram was established in 1983 to provide authentic yoga and yoga lifestyle practices based on the wisdom tradition of yoga and the system of Satyananda Yoga. 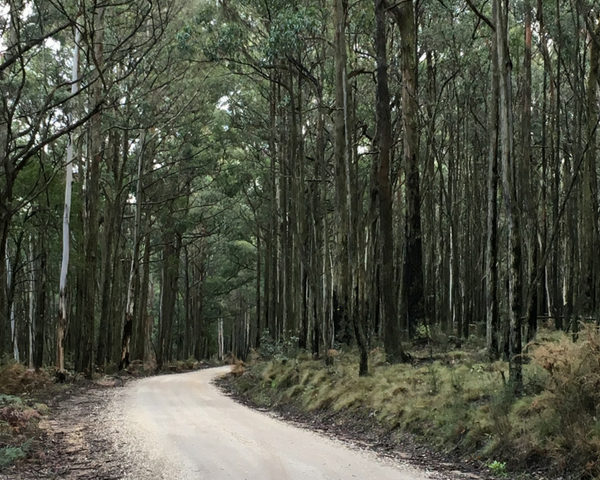 The Wombat State Forest is approximately 70,000 acres in size and the ashram sits within the forest, taking a little navigation and faith to find unless you have detailed directions from the ashram .. but it really does provide an idyllic setting. You can visit the ashram for one day, a few days on a personal retreat, a week or even a month of learning and full participation in yoga and ashram life. While we were there with our Bliss Bomb Retreat-ants, there were other small groups of friends and family attending personal retreats, some long-stayers, and another Hindu spiritual retreat group who added even greater colour and energy for the chanting at night. The practical yoga, yoga nidra, relaxation and meditation classes are a standard part of each day, with other yoga practices supporting a dynamic lifestyle including kirtan and bhajans (group singing), seva (service in ashram life & community), havan (physical fire, and mantra chanting) philosophy, and for some more advanced practices. These ageless yet contemporary aspects of a yogic lifestyle, are central to ashram life which cumulatively builds inner strength, inner reflection and revealing one’s inherent positivity for living an ongoing life inspired by a yogic culture. What is the food and accommodation (really) like? Relax .. accommodation is simple, clean and restful with a variety of private rooms and dormitories, at very reasonable prices. 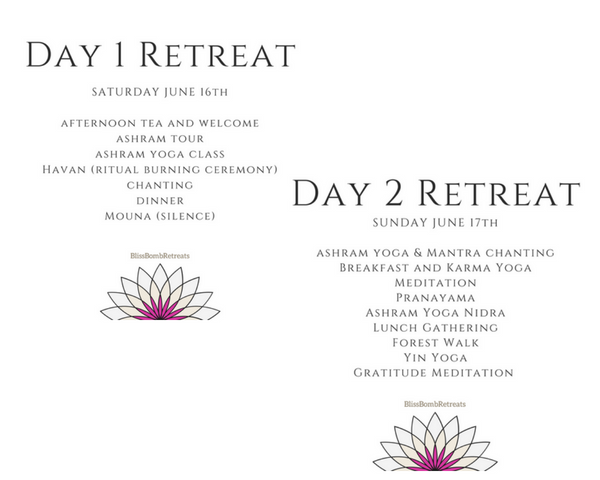 Stays at ashrams are usually all-inclusive and will include accommodations, activities and three meals a day. We stayed in the ‘Krishna’ room (see the view above) and were very comfortable and warm (vital on a dark Winter’s night). All rooms and buildings are given unique spiritual names. And the meals were delicious .. healthy, fresh, mostly vegetarian, plentiful and from the garden straight to the plate. There was even chocolate cake for afternoon tea! Each morning the alarm goes off at 5:30 am to the sounds of a Hari Krishna chant that I almost slept through (thank goodness for the iPhone alarm). The rooms were still lusciously warm but pitch black darkness .. but I quickly brushed my teeth and put on several more layers to walk across to the big practice room looking out over the lake (well, we saw the lake once the sun rose). I loved the gentle morning yoga class. In Satyananda it is common for the teacher to sit at the front of the class and talk through the guidelines for each posture, not giving the usual demonstration or adjustment you might find in a city class. The poses, very considered with quiet attention to the breath, were delightful for the early morning. While nothing strenuous, each pose was slowed down and that helped me gently turn my attention inward, plus we did a few rounds of sun salutations, surya namaskar, that had me quickly removing clothing in the heat. The class finished with a round of sun salutation completed with mantra chanting by Swami .. oh what a treat! Antar means ‘inner’ and mouna means ‘silence. This is a practice for attaining pratyahara (withdrawal of the mind from the sense objects) and at the Rocklyn retreat, silence is practiced after the evening program until after breakfast wash up the following day. This is seen as a time precious for freeing the mind of unnecessary thoughts and worries which naturally accumulate in daily life. This is an experience of ‘being’ rather than ‘doing’ and can be challenging to many people, but is nearly awlasy deeply insightful. I love silence. I would have happily continued the silence practice for at least a full 24 hours and some of the retreat participants mentioned the same feeling .. bring on the silence .. you can’t have too much of that magic stuff! 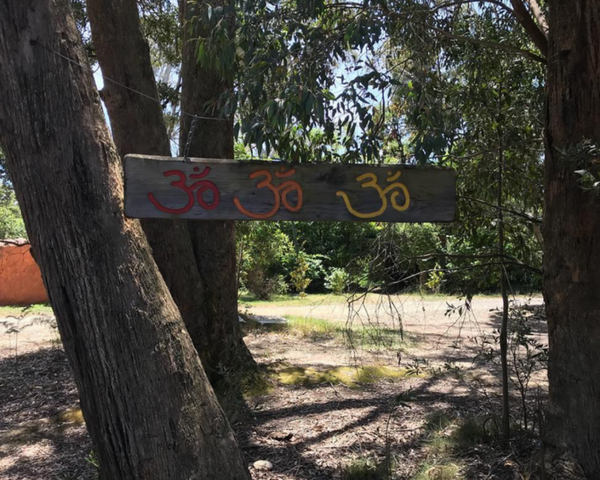 We were also technology free – as the ashram has no wifi or telephone coverage so you are truly off-grid unless you find the single spot in the carpark where (it is alleged) you can get your Telstra phone (only) to fire up. On Sunday before lunch we joined the Ashram community for Yoga Nidra, also known as yogic sleep this is a practice of deep relaxation, where we systematicaly release tensions at all levels of consciousness. Again, the dam outside glistened in the momentary morning sunshine .. and once we had finished I noticed the abundance of rabbits nibbling at the edge of the grass! We also had some time for a deep forest walk which we did in silence as a walking meditation .. listening to the whispers of the forest, the winds high up in the trees, the sound of our feet on the sodden earth .. the inhalation and exhalation, step by step. I so deeply loved this opportunity to spend time at the ashram and share some of these unique and ancient practices. 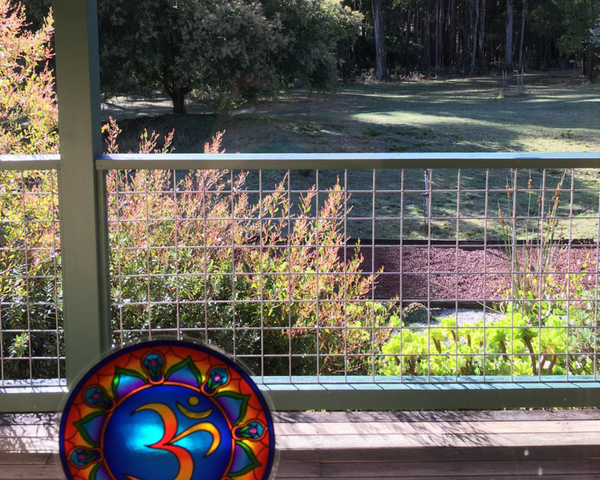 I was surprised how much I was able to enjoy the rhythm of the ashram program, while having spaciousness for our own offering with the Bliss Bomb Retreat agenda. It felt like the perfect balance. 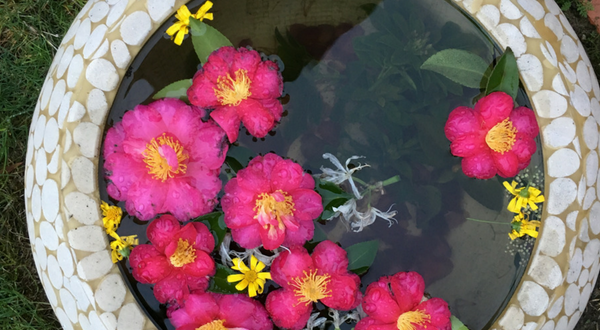 The ashram environment can certainly solidify our personal connection to the beauty and transformational aspects of our yoga and meditation practice. There is indeed a magic in sharing these practices in a group, in the depth of stillness and peacefulness, with commitment and pure intention. I look forward to sharing this unique experience again in the future.